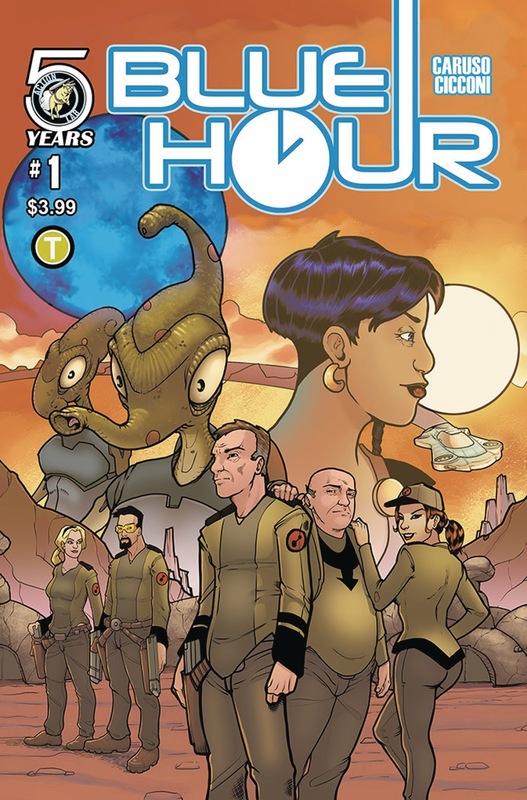 The Fellowship was fortunate enough to obtain a copy of BLUE HOUR #1 from Action Lab Comics. Dino Caruso writes, Chad Cicconi draws, Francesca Zambon colors, and Adam Wollet letters. Lamont is quite a diplomat, and he’s assembled a team and negotiated with aliens to build a human colony on their homeworld, Crux. Now he’s getting older, though, and other, younger colonists have their own ideas on how the colony should operate. And on top of that drama, the aliens are getting restless, never having been all that fond of humans to begin with. And now that the blue sun is alone in the sky, plans are beginning to come together. This gives all the appearances of a frontier story – it’s near future, the leader holds the title Sheriff, there’s not a lot of obvious technology. Lamont’s goal for the colony is self-sufficiency, and there are several threats to that goal. And there are likeable characters and not-so-likeable characters, which leaves a lot of potential wiggle room in the story. And the art works really well, combining a nicely designed alien world with a simple, clean style focusing on people. If you’re into space westerns with lots of barfights (and who doesn’t like barfights?) you’ll definitely want to check this book out. I think there’s a lot of cool story coming our way here. BLUE HOUR #1 is available now at your FLCS or at actionlabcomics.com.